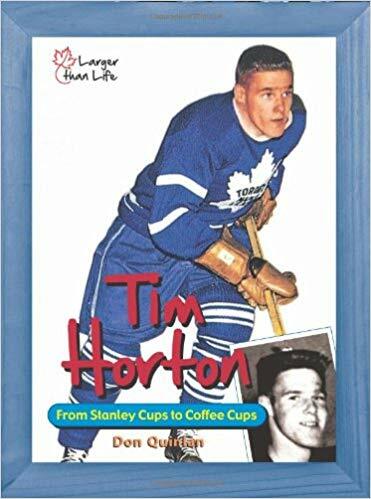 The majority of Canadians know Tim Horton’s name, yet far fewer people know much about the man as a father, an athlete and an entrepreneur. In fact, the author targeted this biography to a generation of readers that are likely to know little more about Horton than the franchise which bears his name. Fortunately, Quinlan accomplished a level of diction that is approachable for a younger audience, yet that comes across as casual and matter-of-fact to an older one. This affords the book an ability to interest a larger range of readers. The narrative begins with Horton’s childhood in Ontario and progresses through the major events, choices and challenges in his personal and professional life, including his marriage to Lori Michalek, the births of their four daughters, and his time with the Toronto Maple Leafs, as well as other NHL teams. Interwoven with information and images, the story continues on to his early death (age 44) and his legacy through his business and charitable organizations. Classroom Connections: This book lends itself to a variety of reading comprehension strategies, especially visualizing and making connections. It would also likely inspire engaging class discussion, as Quinlan includes touchy-but-true elements of Horton’s life (stresses as a professional athlete, his wife’s addiction), yet manages to present the facts without censoring, glorifying or justifying any behaviour. However, the most notable facet of this book is that it absolutely begs to be used as a resource to teach students to negotiate non-fiction texts; it includes colour and black-and-white photographs, captions, insets, quotations, bulleted lists, charts, sketches, caricatures and maps. Although full of information, the layout manages to present as approachable and well-organized, rather than cluttered and daunting.